Brody was surrendered a few months ago. The poor fellow was 23 pounds and unable to walk for a while. I don't have his back story, but it appears he has never seen a vet and also is un-neutered. The vet who came to trim Wilbur's hooves confirmed his poor condition. Brody has to be contained in a room as he cannot move fast enough to protect himself. He is sweet tempered and enjoys sitting at the gate watching the parade of girls go by. It took almost two weeks of Osteo Immune Factors before he could walk a short way. After a while, he could do a brisk waddle. After dinner, we open his room after closing the doors to the rooms the other skunks sleep in, so Brody gets some out time. He likes a good back rub and for someone to scratch areas he can't reach, which is most of him. While I have had my share of obese skunks, Brody is 4 times what I believe is the correct weight for his bone structure. The strain on his heart and other organs is terrible and I don't understand how someone could do this to him. I am surprised he is still alive. His weight is down to 19 lbs and he can walk for a longer period of time. We let him self-regulate his time out of my office as he tires easily. The orange is starting to fade and his coat is much softer. He has been here long enough for his bones to regenerate, obese skunks often have stress fractures. Unfortunately, Brody has a long way to go. He will be assessed when he drops below 10 lbs to see if it is safe to neuter him. Yesterday, Conner was in a time out for his general naughtiness while I was fixing breakfast and we let Brody out for his first supervised meeting with the other skunks. Below is a picture of him with Zedd, my little brown dude, on the left and Brody on right. Darcy is in the front. I believe Brody should be about the size of Zedd. I dunno, Zedd is petite like Logie, Brody looks like a bigger skunk? Who does Wilburs hooves now??. That's heartbreaking.I'm so glad he now will get the love and attention he deserves. What is a good daily weight loss diet for an overweight skunk? The maximum monthly weight loss my vet recommends is not more than 10% of the skunk's current weight. In most cases, that is between 1/2 lb and 1 lb per month for a fat skunk. In the beginning, there is often a big drop in weight so it is important to keep a log of the skunk's weight because if they lose too fast, you need to increase the amount of food or if they lose too slow, decrease amount of food slightly. Losing too much, too quickly is not good. It can cause behavior issues like food aggression which may never go away or other health problems. In cases where MBD or stress fractures are diagnosed or likely, the weight may not come off in the first month because the bones are regenerating. X-rays are needed to verify this. Some skunks have thyroid issues which can slow weight loss but in my experience, the thyroid issues resolve with a species appropriate diet. Bless his heart and he is sooooo Lucky you guys got him. Good Luck Brody!!!!!! So happy he found you. I can't wait to see how handsome he really is under all that fat! What exactly do you feed Brody? I bought a dozen bags of stomp to put buffet on a diet but he will not eat it. I sprayed it with coconut oil and avacodo oil and he still won't touch it. He prefers chicken necks, meal worms, nuts, boiled eggs. I was just trying to get an idea because he is chunky! Haircoat nice and white and soft but way overweight. Brody is beautiful he is a lucky skunk! Yes, Brody has a cute face, I think he will be quite dashing after the weight comes off. All rescues are fed Stomp starting out. I never know what their bone density is like and I can't take a chance that a less structured diet will work. Once they are healthy, I widen their menu. Skunks are heavy for several reasons, wrong food, or wrong portion sizes, or both together. A small minority may have a health condition, like a thyroid issue, that makes it more difficult to lose weight. I would never recommend starting a new food by buying in bulk, because skunks can be contrary creatures on a good day. If you return the unused portion, I will refund your money. If you want to keep it, it should be good for close to 18 months, the bags are marked with an expiration date. A suggestion for switching him over is to put a few pieces in his bowl or plate with every meal. If he leaves them, you just pick up and use for the next meal. After 4 or 5 days, start reducing his portion of the food he likes and increasing the amount of Stomp. At some point he will choose the option that leaves him with a full belly. Letting him choose when and how much is less stressful than plopping down a strange meal. 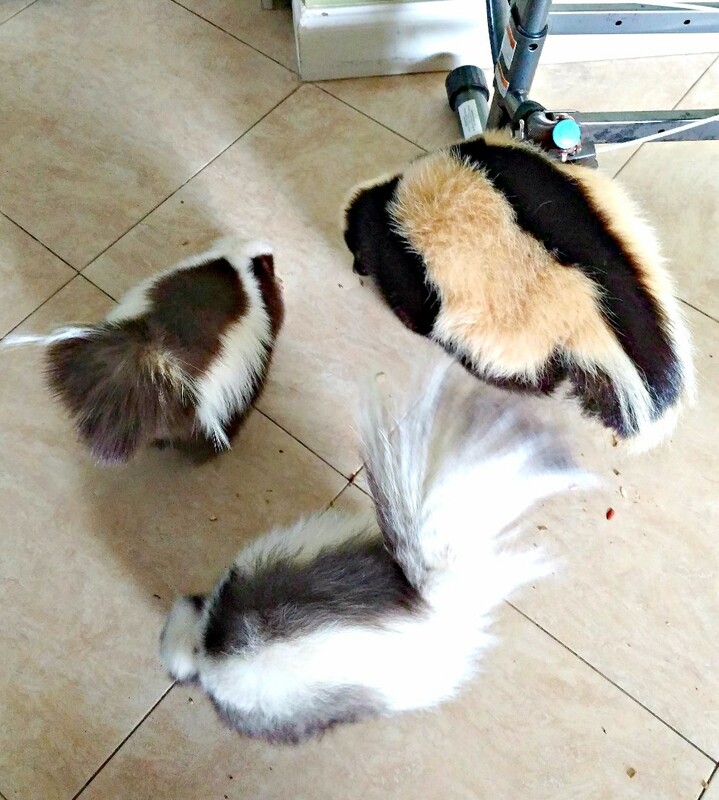 Skunks can be a bit like cats with texture issues. It sounds like yours, for the most part, likes soft food that doesn't involve a lot of work to eat. Dry and crunchy probably feels strange to him. Sometimes this is a sign that there is a dental issue if the skunk is older, but mostly they are just set in their ways. It is also common for them to have seasonal changes in diet. In the spring, skunks want more insects as that is their primary food source in the wild. Most skunks like a variety of foods but there are some that seem stressed by a variety. Our Ricochet arrived at age 8 and other than insects, she refused all other protein sources than chicken Stomp. She wouldn't even consider the Duck or Turkey version either. She ate it until she passed at age 12. You are such a good person helping him!!! I hope he gets healthier and healthier! Bless your hearts! Update on Brody who now weighs in at 17 pounds. He has lost 6 pounds so far. He no longer limps and can run. His fur is still discolored but less orange than before. The tip of his tail is white. 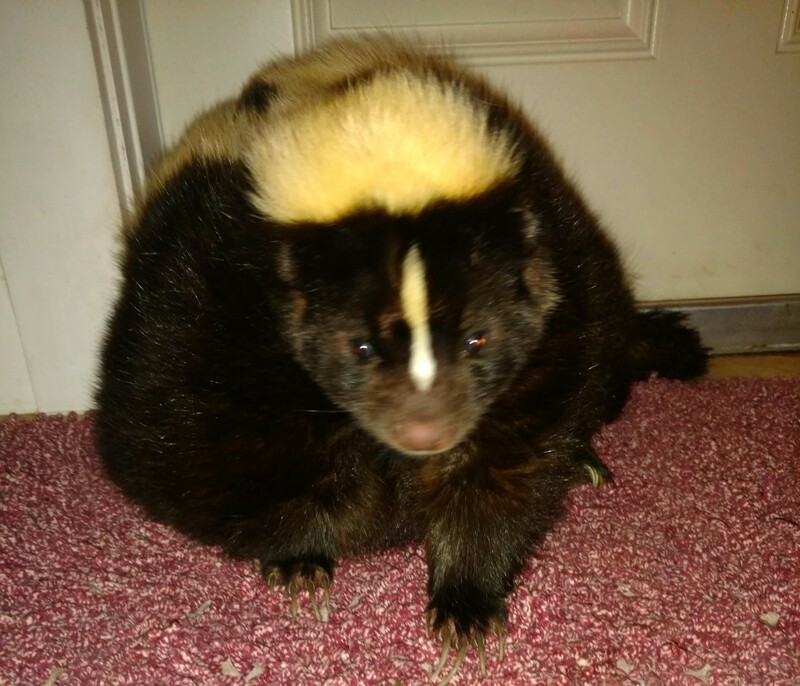 Several times a week, I lock up Conner the alpha and Brody joins the other skunks to socialize. We stand by with gloves in case of a problem. Now he postures like the others. He really enjoys his time outs and lays next to me while I watch tv. I am getting the idea that he is a younger skunk. It is possible, though hard to believe from his condition, he could be a year old and he is definitely not older than 2 years old. He rolls on his back trying to play and opens his mouth. I can see all of his teeth and they have no tartar. When he gets down to 10 lbs, hopefully we can get him neutered so he doesn't have to be kept by himself. You are an angel to the skunkies. You too Jorge..